The Constitution (One Hundred and Twenty-Second Amendment) Bill, 2014 seeks to amend the Constitution of India to facilitate the introduction of Goods and Services Tax (GST) in the country. The proposed amendments in the Constitution will confer powers, both to the Parliament and the State legislatures, to make laws for levying GST on the supply of goods and services on the same transaction. Considering the Indian federal perspective, among the various types of GST including Central GST, State GST or Dual GST (Concurrent & Non Concurrent), the type recommended by various committees & to be implemented in India would be a Dual Concurrent GST model which would enable both Central & State Governments to levy & collect tax on supply of goods and services both. The current indirect tax structure in India comprises of a plethora of taxes which are needed to be paid & complied with various tax authorities. Moreover, these taxes are not inter-creditable leading to cascading effect in the supply chain. The introduction of GST, which is considered the biggest tax reform in India, will entail one effective levy of tax subsuming all most all the union & state indirect taxes which mainly include Central Excise Duty, Additional Customs Duty, Service Tax, Central Sales Tax, Cesses & Surcharges ,Value Added Tax, Purchase Tax, Octroi , Entry Tax, Entertainment Tax etc. Basic Customs Duty, Stamp duty and some other taxes are not proposed to be subsumed under GST and hence would continue as it is today. This reform will not only simplify the compliance requirements but also would ensure a free utilisation of input tax credit in the supply chain, removing the cascading effect. The Dual Concurrent GST Model, proposed to be implemented in India, would comprise of two variants, the Central GST (CGST) and the State GST (SGST). Both these taxes would be levied on supply of goods and services simultaneously, however the input credits of one won’t be allowed to be set off against liability of other. In addition to CGST & SGST, an Integrated GST (IGST) would be levied on the interstate supply of goods and services. The input credits of IGST would be allowed to be set off against the liability of IGST, CGST & SGST in that order. Also, input credits of CGST & SGST would be allowed against the liability of IGST. The comparative implications of this proposed GST regime, in the context of real estate sector, as compared to the present indirect tax regime, is the object of this note. Taxation of Real Estate Sector- Background & Current Scenario: The real estate sector has been a major contributor towards the revenue for the governments at both the levels. One of the most complex aspects of the taxes levied by the Centre and the States is the treatment of works contract, land and real property. The taxation on real estate has witnessed significant tax changes over past few decades; changes which have led to diversified regulations and practices being followed in different States. 20/06/2006: The Apex Court’s decision in the case of K. Raheja Builders Corporation which declared the levy of VAT on builders for the first time. There was also 46th Amendment in the Constitution. 01/06/2007: Levy of Service Tax on works contract under Finance Act, 2007. 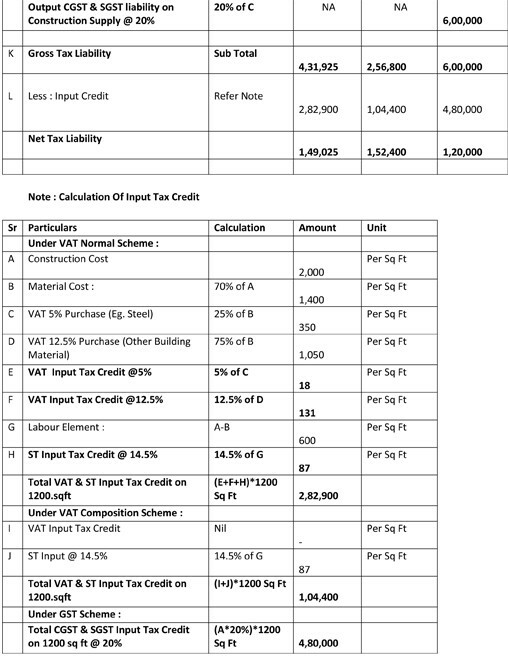 09/07/2010: Notification on Composition Scheme under Maharashtra VAT, applicable to Construction Contracts for all agreements registered after 1-4-2010, to be charged with 1% VAT, with no input credits available. 20/06/2012: Notification No. 26/2012 providing an abatement of 75%/70% on the total contract price (including the cost of land). The real estate transactions, particularly the transactions involving the construction of flats, dwellings or buildings, for selling them along with the interest in land can broadly be categorized in three parts viz. the value of divided or undivided interest in land. The states apply VAT to the goods portion and the centre taxes the services portion, with no explicit tax on the transaction value of land (other than stamp duty). Though such split may sound reasonable or logical, the same is fictional in nature and hence more often leads to dual-taxation and difficulty in implementation and compliances. A developer/ builder incurs various types of costs during the construction phase. 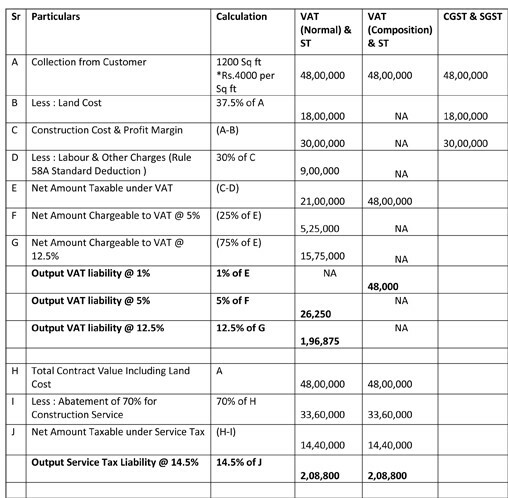 Such costs have different indirect tax components, most of which are costs in the system as many of them are not creditable either to the Developer/ Builder or to the end-customer. All these taxes collectively have a substantial impact on the final price of the units sold by the Developer/Builder. Such non-creditable costs are one of the major causes for the higher price which is charged to the ultimate customer. GST and Real Estate Sector: In the proposed GST regime, the restrictions on credit utilization (other than basic customs duties and additional tax @1%) would be eliminated, thus strengthening the credit chain in the system. If this so happens, there will be increased credits available in the procurement chain and hence better utilization of input tax costs towards output GST liability. It is widely expected that GST would reduce the construction cost in the hands of the developer and thereby aid in reducing or at least maintaining the current level of prices in the real estate sector. The Developers/ builders can also look towards some increase in their margins. The comparative tax cost under the present tax regime and the proposed GST regime can better be analysed by way of a case in the annexure enclosed. This case gives a brief idea about the reduction in final tax liability in the proposed GST, as well as of a lot of simplification in compliances considering a single levy. The only threat could however be high GST rates which will offset any possible gains on incremental credits. Transitory Provisions: There will be many contracts which will spill over to the new GST regime. It is expected that the Government will bring out appropriate governing mechanism for determining the place of supply post GST implementation and also for the smooth transition of such ongoing projects. Point of Charge of GST: The Apex Court’s observation in L&T case that VAT to be applicable only on construction carried out after agreement of sale is entered was a game changer for VAT and the industry is still grappling with the impact of the same on payment of taxes and availment of credit. This principle could continue to apply even under the GST regime, as there can be a supply of goods and services only from the date the agreements are entered into with the buyers, unless the GST legislation introduces a deeming fiction. Compliance with GST: The hitherto system of taxation, involving multiple compliances under state and central laws, will be done away under proposed GST which is one of the most welcomed feature by the industry. Moreover, confusion on the part of dealer for opting either the regular scheme of taxation or the composition scheme of taxation shall also be cleared. Joint Development Agreement: Under the GST regime, special focus would be required on the taxability of landlord-developer transactions, especially on the taxation, valuation and timing for payment of taxes on such transactions and also on the liability of landlords for sale of their portion of constructed area before completion of construction. Renting of Property by Builders: GST should have a significant impact for commercial property developers, who today are burdened with high costs as no credit is available on construction services used for developing a commercial property which is then rented out. It is expected that under the GST regime, there should be a smooth flow of credit and current restriction on construction related credits not being available for offset is expected to be removed. This would help reduce the project costs in the hands of the developer, which should have a positive effect on rentals. Service tax is not levied on the renting of immovable property for residential purposes however, VAT and service tax are levied on Construction. It is not yet clear whether proposed GST will provide differential tax treatment to the residential properties. Currently, the real estate industry is passing through a widespread recession with months of inventory remaining unsold with builders/developers. Even the Real Estate Bill, which recently received the President’s assent, is going to impose several restrictions on Builders/Developers. On this backdrop, the GST appears to be a benefactor for the real estate regime, primarily in the light of the expected free flow of credit, which should translate into an increase in margin in the hands of the developer. It would also ensure a substantial reduction in compliance of tax laws. Whether these benefits will percolate into the end customers / users is to be seen because pricing in this sector is more driven by market forces than on costing principles. More importantly, as the GST regime is expected to impart greater transparency through market mechanism, it is imperative that real estate transactions forms an integral part of the proposed GST design. A builder in Maharashtra constructs & sells a residential flat of area (say) 1200 sq ft. @ Rs.4000/sq ft. for the agreed consideration of Rs. 48,00,000/-. The proportionate land cost for the said flat (say @ 37.5% of the value) is Rs. 18,00,000/-. The construction cost inclusive of material and labour is assumed @ 2,000/-per sq ft. The construction cost is divided as 1400/-sq ft. as material cost and 600/-sq ft. as labour charges. The ratio of purchases of material consumed chargeable to VAT at 5% and at 12.5% is (say) 25:75 respectively. Current regime: VAT regular scheme & Service Tax. Current regime: VAT composition scheme & Service Tax. Proposed regime: CGST & SGST. From the above hypothetical case, it can be observed that with the proposed GST rate of 20%, the current tax cost can be reduced by (approx.) Rs.30,000/-i.e by about 20% of the current cost. Also, the compliances of multiple taxes with their multiple abatements & composition schemes, would be reduced down to a single point compliance. With above explanation on GST on real estate, it seems that benefit will be either to developer or builder as they will able to take full utilization of input credit. But end user or buyer will not be benefited in it. This is really a big issue, where at one end we are discussing on home for all by 2020, while on other end this GST will increase property price for end user. In my opinion this Govt should come up with guideline which could benefited to end user but not to developer and builder..
Dear Readers, several attempts have been made that real estate will have disadvantage as end customer price would go up. this is contrary to the what GST is expected to bring. In fact, many developers have started charging tax in line with GST regime and justification is given that this will be liable to so much of tax. In current regime, end tax cost for property developers (Flat sellers) is around 25-31%. whereas under GST, larger share of input tax credit will become available for set off. On the other hand GST rate will come down to 18% or lower than 18%. In addition value of land will not be subject to GST. Then from which angle, it is said that real estate will be costly under GST. This is complete myth on the basis supply of land will be classified under supply of service. Conspicuous tax manager has blow an issue out of proportion and without realising the fact that GST regime is not intended to tax immovable items. In case of contract of sale also, value of land will not be subject to GST. Users, experts can put down here their views if it is otherwise basis concrete justification. Nice article. GST could bring in clarity and unambiguity in the commercial real estate sector, conceivably reduce cost of property ownership. Here are top ways that CRE sector will benfit from the implementation of Goods and Service Tax.